Few Vermont acts, save perhaps Grace Potter & The Nocturnals or various members of Phish, could compete with a Junior Brown show and outdraw him. But last April, Starline Rhythm Boys did just that, pulling in some 800 people for a benefit at the Sheraton Hotel in South Burlington, while just down the street at Higher Ground, the legendary slide guitarist played a woefully under-attended show. "We were wondering if [Brown] was going to hurt our draw, so we looked into it and found out he had about 60 people," says SRB stand-up bass player and chief songwriter Billy Bratcher. "I guess he didn't, really." In fairness, the cause - the Cancer Patient Support Program - likely tipped the scales in Starline's favor that night. Even so, the rockabilly trio is just about the safest draw in the state, averaging more than 150 shows a year, most of them around Vermont. If that number seems absurdly high, it is. Just ask any struggling local band; most count themselves lucky to score a couple of gigs a month. 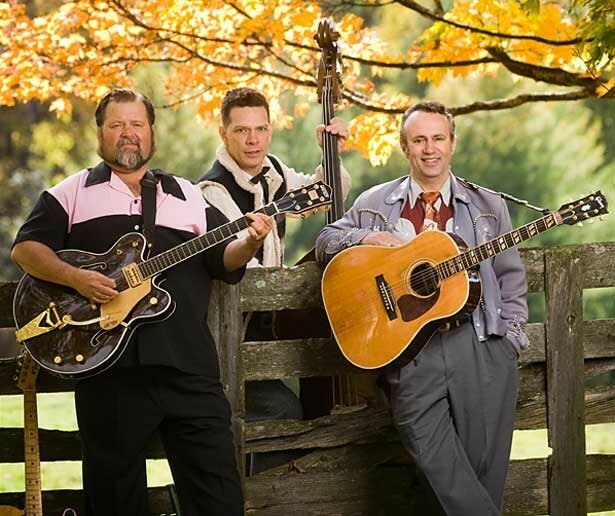 But Starline Rhythm Boys are a throwback to a bygone era, both in their aesthetic - vintage and original tunes in a Bakersfield honky-tonk/cool-cat rockabilly/high lonesome country vein, with sharp outfits to match - and their tireless work ethic. "The Benefit Band," as a certain local scribe once dubbed them, rarely turns down a chance to ply its trade. Indeed, Bratcher, 45, acoustic guitarist-vocalist Danny Coane, 60, and lead guitarist-vocalist "Big Al" Lemery, 55, have become Vermont institutions precisely by taking any gig that comes their way. And they are beloved by music fans of all persuasions. They are just as comfortable rocking a roadhouse such as Charlie O's in Montpelier as they are playing a Fourth of July parade in Randolph or a retirement home in Bennington. This week, the three will celebrate an almost unheard-of milestone in modern Vermont music: their tenth anniversary. "This band played at the Twinfield School to raise money for the Plainfield municipal building's elevator fund," says Bratcher. "We go from there to opening up for Ricky Skaggs at the Flynn Theater." That statement aptly reflects Starline Rhythm Boys' remarkable versatility, an unquestionable key to their success and longevity. Whereas many bands would turn down community-center gigs or retch at the thought of being a "wedding band," SRB have no such pretensions. "We have a repertoire that's big enough that if we get hired to do a '50s sock hop, we can do that all night," says Lemery. "Or if it's a straight country gig, we can do that all night. We just have so much material, we can do almost any kind of gig." And they do. To play a show almost every other day of the year - in Vermont, no less - you'd pretty much have to. While shows that relegate the band to background noise are unglamorous, they do serve a purpose. "There's something to be said for the easy gigs," says Bratcher with a smile. "They pay better." "And we usually sound better because we don't have to crank it up," injects Lemery. "We could practically do some of those gigs with no PA - and we have a few times." Those "lesser" gigs also cumulatively raise the band's profile. Even the most casual follower of Vermont music knows Starline Rhythm Boys. That familiarity leads to more notable appearances, such as the aforementioned gig with country star Ricky Skaggs as well as shows with legends such as Charlie Daniels, Delbert McClinton and the late Vassar Clements. It also leads to more income, which the band members rely on. "One thing that's interesting is the diversity of the crowds we've played for in the past, whether it be benefits, weddings or political figures," says Bratcher, noting that the latter "have ranged from Bernie Sanders to Rich Tarrant, Jim Douglas to Anthony Pollina. "Martha Rainville wanted us, but she never got back to us," adds Lemery. "It has nothing to do with who we're gonna vote for." Bratcher agrees: "It's just a job. It's work." But for this group, playing music is not "just work," as anyone who's seen them can tell you. Whether reveling at Red Square, crooning for a new bride and groom, or entertaining families on a village green, Starline Rhythm Boys are profoundly passionate - and professional - about their craft. They're knock-your-socks-off players and exuberant, riotously entertaining performers. All of which helps explain why their profile is rising beyond the Green Mountains. Hunt plans to bring the band to Austin, Texas, next year during the prestigious South By Southwest conference in March. But not for SXSW. "It's called Not South By Southwest," explains Coane. "When [SXSW] started, it was mostly for Americana music, but then the industry got involved and now it's this huge thing. So this guy, John Conquest, who does the FAR charts, he got pissed off and said, 'We're gonna go back to the original.'" "It's the anti-South By Southwest," adds Bratcher. Cow Island is set to unveil an SRB "best of" record entitled Green Mountain Style - on vinyl because it "sounds better," declares Coane. Place an order for that album at the anniversary party this Friday and the band will throw in a free vinyl 45, featuring longtime crowd favorite "Drunk Tank," as well as a previously unreleased cut on the B-side, just to say thanks to fans. In August, SRB will release their fourth CD, a live album from a two night stint at Charlie O's in Montpelier last fall. Starline Rhythm Boys are an old-school band in a modern time, fueled by an all-too-rare commodity in the music industry: "It's passion, man," sums up Bratcher. "That's what the band still has after 10 years. You lose the passion, you've lost the band." Starline Rhythm Boys 10th Anniversary show this Friday, June 27, at Nectar's in Burlington, with Abby Jenne & the Enablers, 9 p.m. $5.